After I ordered I was worried King Of Fakes was a scam but I am happy to say that is not true. 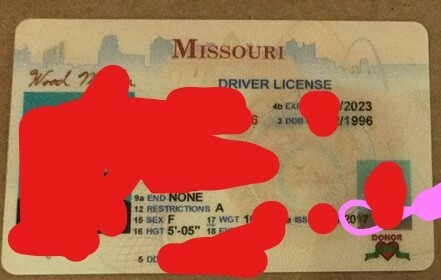 Here is my review of my Missouri ID I received. Communication: 10/10- His CS is such a nice person to talk to. Walked me through the process and made it easy. Template: 9/10- At first glance, you really can’t tell any difference between it and a real. Should have no problem using in a bar, club, or liquor store. After looking at it under a loupe, it’s blending is just the tiniest bit off from a real ID. Also might be because my real ID is a few years old. Photoshop: 10/10- Super professional. Looks just like my real one. Same everything. Absolutely brilliant. Scanning: 10/10- Out of all IDs I have ever owned, this is the first one I’ve ever had that has ALL the info correct and scans my weight, height, and eye color. Holos/OVI: 9/10- Virtually Identical to a real. Again, slightly brighter than my real ID, but my real ID is a few years old so that may be why. Conclusion: The feel on this ID is just like a real. MO is so hard to nail but these guys did it. 10/10 experience. Will recommend to my srat for sure. Why the Military Should Set Up a "Digital ROTC"